It’s a profession where many wrongly assume university is the only entry route, but this is a misconception which local firm EQ Chartered Accountants is keen to correct. While offering an unrivalled training package to graduates, the firm also welcomes new recruits directly from school. With that in mind, EQ attends a number of secondary school careers and alumni events, including a recent visit to Dundee’s Harris Academy where pupils enjoyed a fact-finding session on accountancy, exploring the career pathways involved. The firm hopes to return later this year to develop this partnership. EQ also supports and sponsors a variety of local educational initiatives and events, from prize-giving ceremonies and ‘Maths Week’ events, to inviting pupils to attend sector-specific events. This year, the firm, which has offices in Cupar, Dundee, Forfar and Glenrothes, will once again offer Trainee Accountant school leaver positions. Jenny continued, “We are always looking to invest in new talent and that talent pool extends beyond university graduates. For one reason or another, some school leavers feel university simply isn’t for them so we work directly with schools to try and identify the bright sparks who have a strong chance of thriving and progressing within the company. And it works! 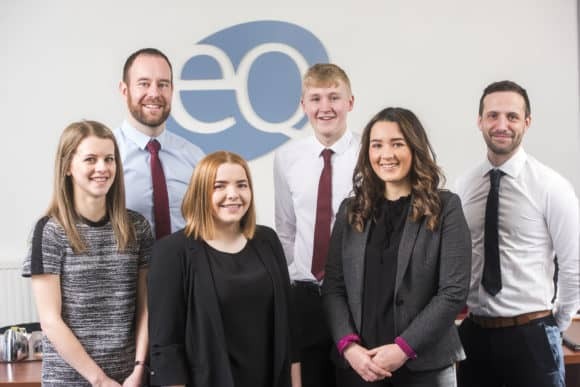 There are currently seven staff within EQ, from a Partner through to new trainee accountants, who joined the firm directly from school. Mark Smeaton (33) joined the practice from Forfar Academy and qualified with the Association of Chartered Certified Accountants in 2008. Work experience is also a positive stepping stone and, each year, EQ offers work experience slots for those in school with a genuine interest in accountancy. For more information on working with EQ, visit www.eqaccountants.co.uk.